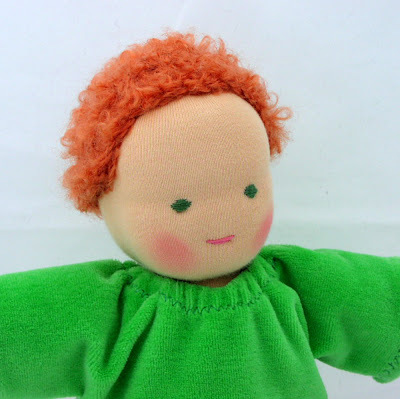 When I look at the assortment of dolls that are labeled "Waldorf" on various sites these days I am always amazed. It looks like people are more and more getting away from the original idea of Waldorf. What is that idea? 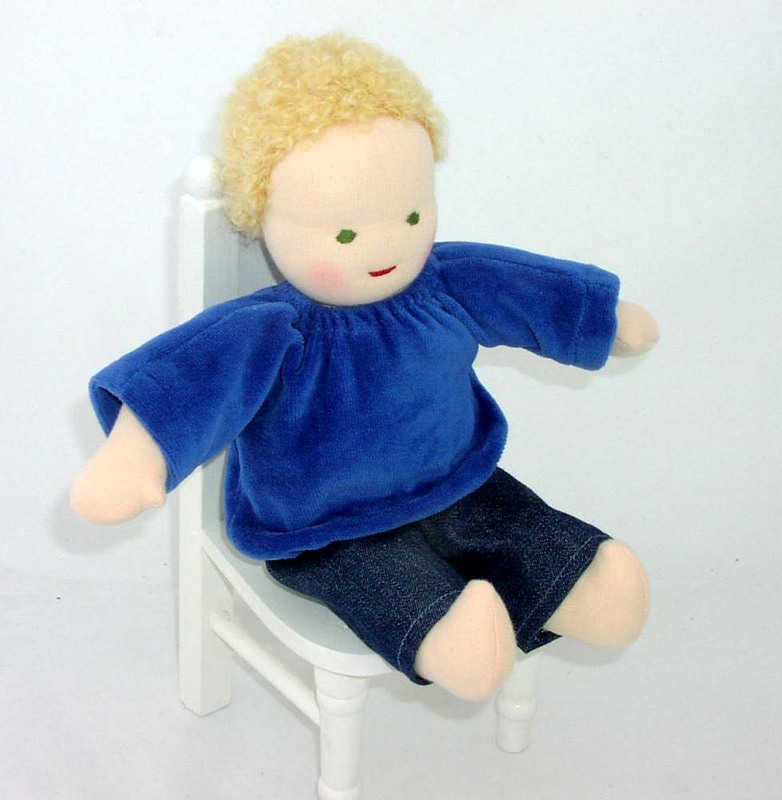 The two main ideas behind waldorf style toys, I would say, are: Simplicity and Nature. I have been making dolls in the Waldorf tradition for over 10 years now. It is an old tradition of making cloth dolls developed in Germany, where Waldorf Schools were started in 1919. According to the Waldorf philosophy, dolls should be made from what nature has given us: natural fibers such as sheep's wool, mohair, and cotton. 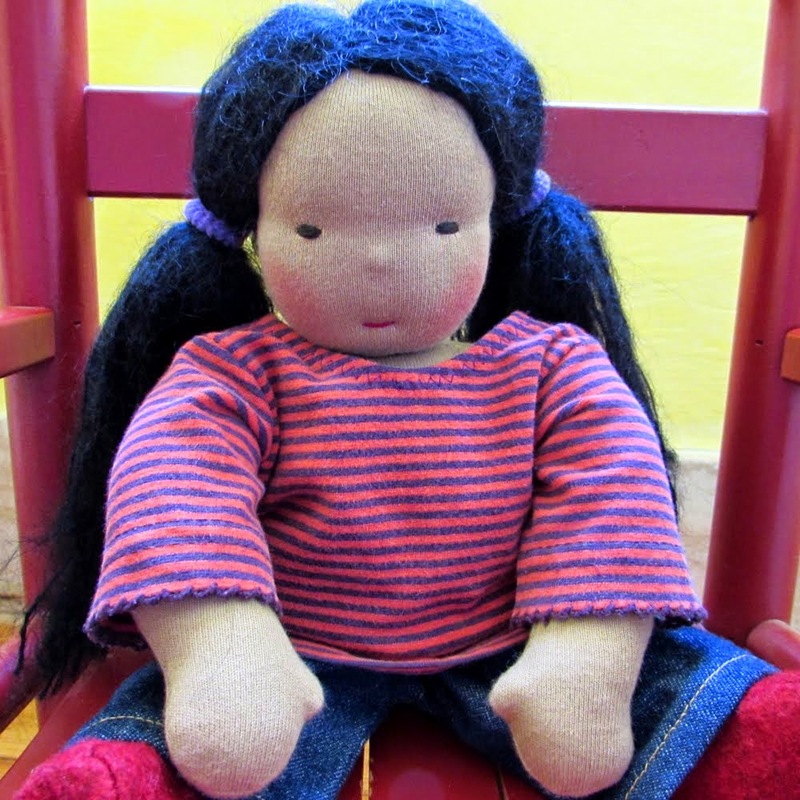 When I encountered my first Waldorf doll in Germany I was instantly smitten. How was it possible that a doll this simple was so beautiful? How could it be that something so basic held such great attraction to a child and the child in me? This first Waldorf style doll I encountered, made by a mom for her own child, had a simple line for a mouth and two dots for eyes. Her clothes were equally simple. She had a simple dress withouth any thrills. And the best part of it: She was warm and huggable. Not plasticky and cold. Often I see dolls that are not made of natural fibers. Sometimes people stuff with fiberfill or use synthetics for the clothing and accessories. I see noses big and small, I see eye browes, dimples, freckles, belly buttons, fingers, toes, and elaborate hairstyles. I guess some people just prefer details. Does a doll without a nose somehow strike people as crippled or incomplete? Does it offend when a doll has stumps for hands or is missing a belly button? Hmmm. Wasn't that the original idea? Are you able to fill in the blank and make your imagination soar? If your answer is yes, you may prefer my kind of doll. I suppose I could add all those details. I have made dolls with noses but it feels weird. I think my reason I am here is to preserve the original idea of Waldorf. I want to stay true to my German roots and a more traditional approach to dollmaking. I don't want the simple dolls to become extinct. To me less is often more. So I'll keep creating what I perceive as the "essence of doll". The tradition and simplicity of the dolls are what drew me to them as well. Your dolls in particular, with their superior craftsmanship, simply stand out. Thanks, Sarah! I relly appreciate your comment! I love Waldorf with red orange hair.